In August, white nationalists and neo-Nazis descended into Charlottesville, Virginia. They were supposedly there to protest the removal of a Robert E. Lee statue. The far left Antifa crowd was also there. Melees broke out, a woman was killed, and scores of counter protesters were sent to the hospital when a white nationalist plowed through them with his car. It was an ugly moment. 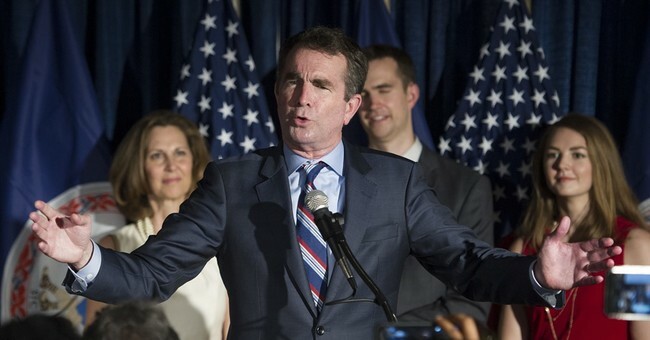 As the Virginia gubernatorial race enters its final days, the Democrats appear to be getting nervous. There may be something in their internal polling showing that Republican candidate Ed Gillespie could win because they’re pushing this absurd and borderline libelous mailer linking him to white nationalism. …the Northam campaign issuing a deliberately provocative mailer, trying to smear Republican Ed Gillespie. This one hits very close to home, because it politicizes the Charlottesville tragedy of Aug. 11-12. Not that the issue hasn’t already been politicized. And that’s part of the problem, part of the reason we’re having such difficulty coming to rational conclusions about the community’s failures before, during and after the white supremacist invasion. We don’t need state candidates trying to use our pain to their political advantage. The mailer features a photo of the Charlottesville Tiki-torch marchers, and condemns Mr. Gillespie for not speaking out against President Trump’s now infamous “good people on both sides” comment made on Aug. 12. Mr. Gillespie did, however, denounce the white supremacists — before the rally ever took place. …the Northam campaign wants to do everything it can to tie Mr. Gillespie to the unpopular president. And that’s because the race is so close; the Democrats want to grab every advantage they can scramble for, even if it means political exploitation of the Charlottesville tragedy. For his opponent to challenge him on the degree to which he endorses the Trump agenda is fair game. But to take the tragedy of Charlottesville and exploit it for political advantage is stomach-turning. Virginians head to the polls on November 7.